Barbados is a truly magical place to visit, and even though it is so small, you are bound never to be bored. This is a relatively small island, stretching for just over 20 miles in length, however, size isn't everything and with some superb locations pitted against white sand backdrops you'll discover endless ways to spend your time as the sun continues to shine.Whatever you're into: sports, relaxation or nature, Barbados has got the lot and if you're looking for a few more temptations to whet your whistle then check out a top ten list of things to do in Barbados. Sport is a big part of life in Barbados so whether you’re a spectator or a participant there will be something for you to enjoy. There is a fantastic array of watersports on offer with excellent locations for scuba diving, catamaran sailing and windsurfing. The rockier parts of the island lend themselves perfectly to paragliding. Golf is extremely popular here too with an abundance of clubs and breath-taking courses to challenge even the most experience golfers. 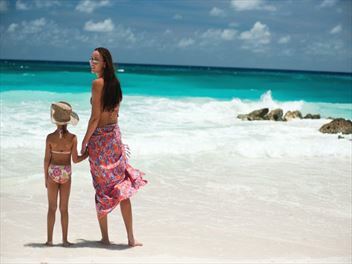 Enjoying a beautiful summer climate that is timed perfectly for the many school holidays – as well as fresh Atlantic breezes that help keep the temperatures manageable, Barbados boasts a host of attractions that make it perfect for a family escape. 4X4 off-road island tours make a great change of pace from the beach and allow visitors to experience views of Barbados that they otherwise would not get to see. Most local tours accept children between the ages of five years and 12-years-old and offer trips to the beautiful north and north-eastern side of the island. Edge Cliff, Bathsheba, Joe’s River Forest are popular highlights of the tour. Tours often include trips to the beach as well so don’t forget to wear swimming shorts under your clothes so you can hit the occasional deserted stretch of pristine sand. A light lunch is often provided and with space for up to 10 or 11 guests, 4X4 tours are great days out for all the family. Like its Caribbean sister islands, Barbados is known for the most amazing, palm tree-lined beaches. While all of them are fantastic, each of them has its own individual character and charm.Although it sits on the Atlantic Ocean side of the south east coast, Crane Beach is generally considered one of the best beaches on Barbados with a wide stretch of palm-fringed, white sand and medium-sized waves for anyone who fancies a go at surfing or bodyboarding. Waves can sometimes be a little high for very young children but it is generally a great beach for families and picnics.Sandy Lane is a hidden-away stretch of wide, beautiful sand that is ideal for walks in the evening with a rocky end that generates medium surf that is popular with intermediate surfers and water sports enthusiasts. Water sports can be booked directly from one of the beach vendors.Ju Ju’s is perfect for swimming; a wide, safe beach located on the west coast of Barbados. A reef close to the shore encourages sea turtles and other marine life, making it great for snorkelling and scuba. You can rent umbrellas at the popular Ju Ju’s Beach Bar or just settle down into a lounger with a cocktail. Accra Beach is the most popular on the south coast and is ideal for small children thanks to a manmade groyne which helps keeps the waves small. Barbados boasts some amazing kids’ clubs that offer a range of activities to keep both young and older children entertained during their holiday, allowing mum and dad to enjoy theirs as well. Turtle Beach by Elegant Hotels operates The Flying Fish Kids’ Club, which is open from 9 am to p.m., and is focused on children aged three to 12-years-old. It offers a broad range of indoor and outdoor games such as beach cricket, table tennis, themed parties, movie nights and karaoke. Bougainvillea Beach Resort includes child-friendly activities that include; water sports, a games room with a huge 57” TV for movies and games and Adventure land Playroom, which is ideal for children under 12-years-old. Cobblers Cove offers a complimentary range of activities for children from 8 July to 4 September that includes; sailing lessons, water sports, swimming with turtles, arts and crafts and an additional babysitting service. The Colony Club has a paddle-boarding clinic that is sure to be a hit with teenagers and older children looking to try something new. The snorkelling at Mango Bay is some of the best on Barbados and the beach is relaxing curve of beautiful white sand, safe and ideal for children. If 4X4s aren’t your thing, try a different kind of off-roading at one of the horse riding centres on Barbados. It’s a popular experience for both couples and families and offers a chance to trek up into the hills and through the beautiful interior landscape of the island, such as at the Flower Forest or other areas of outstanding natural beauty. Your expert tour guide helps you organise the right horse for your experience level, and age if you’re a young person. The Caribbean International Riding Centre also offers lessons in dressage and show jumping for more confident riders. Then move out to the coast and cool down your horse riding through the surf on the beach in a safe environment, perfect for whether you’re an experienced rider or not.